Nothing But the Truth Publishing, 9780997296211, 366pp. All the Women in My Family Sing is an anthology documenting the experiences of women of color at the dawn of the twenty-first century. It is a vital collection of prose and poetry whose topics range from the pressures of being the vice-president of a Fortune 500 Company, to escaping the killing fields of Cambodia, to the struggles inside immigration, identity, romance, and self-worth. 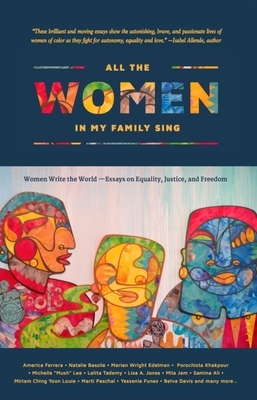 These brief, trenchant essays capture the aspirations and wisdom of women of color as they exercise autonomy, creativity, and dignity and build bridges to heal the brokenness in today's turbulent world. Sixty-nine authors -- African American, Asian American, Chicana, Native American, Cameroonian, South African, Korean, LGBTQI -- lend their voices to broaden cross-cultural understanding and to build bridges to each other's histories and daily experiences of life. America Ferrera's essay is from her powerful speech at the Women's March in Washington D.C.; Natalie Baszile writes about her travels to Louisiana to research Queen Sugar and finding the "painful truths" her father experienced in the "belly of segregation;" Porochista Khakpour tells us what it is like to fly across America under the Muslim travel ban; Lalita Tademy writes about her transition from top executive at Sun Microsystems to NY Times bestselling author. This anthology is monumental and timely as human rights and justice are being challenged around the world. It is a watershed title, not only written, but produced entirely by women of color, including the publishing, editing, process management, book cover design, and promotions. Our vision is to empower underrepresented voices and to impact the world of publishing in America -- particularly important in a time when 80% of people who work in publishing self-identify as white (as found recently in a study by Lee & Low Books, and reported on NPR). Natalie Baszile, whose best-selling novel Queen Sugar was adapted for Oprah's TV channel by award-winning director, Ava Duvernay, writes of returning to Louisiana to research Queen Sugar and finding the "painful truths" her father experienced in the "belly of segregation." Kelly Woolfolk, an attorney who acted in Spike Lee's School Daze before working in the legal department of Virgin Records & as counsel for a television production company, writes about her identity growing up with "good" hair, "piss-colored," & accused of talking white. She now sees her son's experience in Oakland in a private school with the cloud of oppression that killed Trayvon Martin & Tamir Rice. Blaire Topash-Caldwell, a PhD student in the Department of Anthropology at U NM, writes about reclaiming Indigenous space after the history of trauma of boarding schools, the criminalization of traditional religions, the stealing of Indian children and other structural violence's have alienated indigenous communities from healthy sociality. Lalita Tademy, NY Times bestselling author of three historical novels, writes of being the first in her family to graduate college and eventually becoming VP and General Manager of Sun Microsystems. Leaving corporate life after 20 years to write a novel based on her Louisiana family, she was rejected 13 times before finding a publisher for Cane River, Oprah's summer Book Pick in 2001, translated into 11 languages and San Francisco's One City, One Book in 2007. Michelle "Mush" Lee is a poet and educator, recipient of the New York Hip Hop Theater Festival's Future Aesthetic Grant and Compasspoint's Next Generation Leaders of Color Fellowship. She teaches in universities across the country and is on the Board of 826 Valencia, and a Senior Teaching Artist at Youth Speaks. Her poem, Stay, is a meditation on birthing & fighting to stay put when everything in you says run. Mila Jam believes she has made the world a better place by not masquerading and choosing to live in her truth loving the boy people thought she was and the woman she is. An award-winning NYC nightlife recording artist, entertainer and CEO of the artist collective: THEJAMFAM, Mila toured in the hit Broadway musical RENT. Want Chyi has an MFA in fiction from Arizona State University and was the International Fiction Editor of Hayden's Ferry Review. She claims that the first time she went to a Punk concert as a sophomore in high school, she could forget she was not Asian enough, did not fit in, and was too small, too novel to be real to the 90% white town of Carmel, Indiana. Rhonda Turpin's home is Cleveland, Ohio, but she has been in prison since 2004, serving a 15-year sentence for a white collar, non-violent offense. Murderers serve smaller sentences. Her essay, Prison Parenting, explains the increase of the female prison population of over 300% in the last decade. She wrote her first book at Alderson West Virginia Prison Camp, mentored by Martha Stewart who was in the same facility. Marian Wright Edelman, famed founder and president of the Children's Defense Fund, lawyer, advocate for disadvantaged Americans, writes about her role models Harriet Tubman and Sojourner Truth, whom she wears on medallions around her neck. Other role models Ella Baker and Jo Ann Robinson remind us "of a great heritage of strength, courage, faith, and belief in the equality of women and people of every color." Lisa Victoria Chapman Jones shares the frightening journey of her 18-month-old son's two-year fight with leukemia. Jones, a Yale graduate with a MFA in film from NYU co-wrote three books with Spike Lee, all companion books to his films: Uplift the Race: The Construction of School Daze, Do the Right Thing, and Mo' Better Blues. Her memoir is Good Girl in a Bad Dress. Jennifer De Leon writes of her Guatemalan mother treating education like a religion in their household. De Leon is an author, editor, speaker, consultant, and creative writing instructor at Emerson College and GrubStreet Independent Creative Writing Center. She is the editor of Wise Latinas: Writers on Higher Education and much more. Samina Ali suffered a seizure and hundreds of strokes while in labor and giving birth to her son Isham. She writes of the two and a half years it took to recover. Ali is an American author and activist and serving curator of Muslima: Muslim Women's Art and Voices, a global, virtual exhibition and co-founder of the American Muslim feminist organization Daughters of the Hajar. Her debut novel, Madras on Rainy Days was a finalist for the PEN/Hemingway Award. Alicia Garza reflects on Barack Obama's final State of the Union address where she sat as the guest of Rep. Barbara Lee (D-CA). She was disappointed he did not the inequities of wages for Black women, and no tribute for India Clarke, a black trans woman killed in Florida last year. Garza, an African American activist and editorial writer birthed the Black Lives Matter movement with Opal Tometi and Patrisse Cullors. Porochista Khakpour is an Iranian American novelist, essayist and writer. Her personal essays in the New York Times reflect on her experiences. Her novels are: Sons and Other Flammable Objects and The Last Illusion. Khakpour's essay is about Persian New Year, or Nowruz, is not a holiday Iranians take lightly as it is any thousands of years old with roots in ancient Indo-Persian culture.